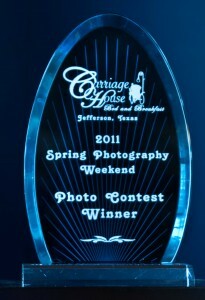 We had a blast with all of the photographers that came out to Jefferson, Texas this past weekend for the 2011 Spring Photography Weekend. 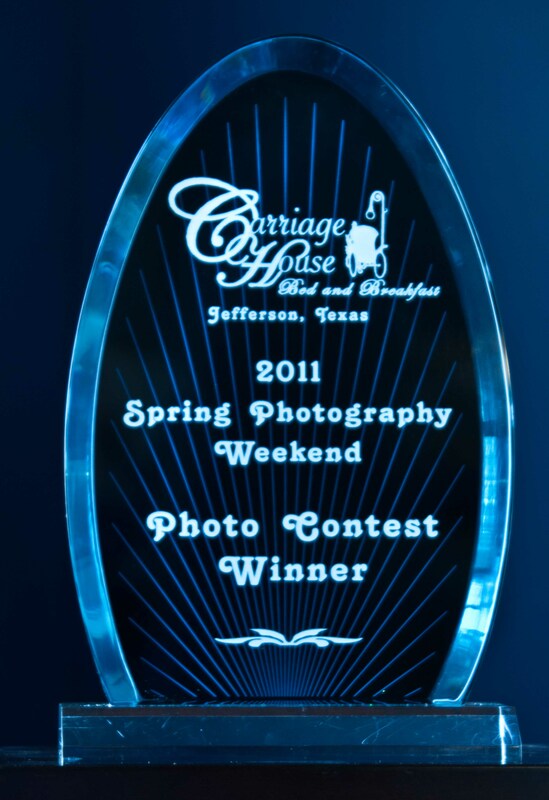 I will write my recap on this amazing weekend later, but right now, I want to remind all of our participants that the Photo Contest Page is now live on the Carriage House B&B website. For anyone who participated in this weekend’s event, please upload your favorite photo to the Carriage House Bed and Breakfast website. On the left hand navigation bar, please find the link for the Photo Contest page. Complete the form and upload your photos. We will add your photos to the page by end of each day. You can submit your pictures up until 3/28/11. The winner will be won by popular vote. Please have your friends, family, coworkers, and photo club buddies vote on your picture. The winning picture will be announced on Facebook, Twitter, email, this blog, and the photo contest page. Voting will end 4/4/11 and the winner will be announced 4/5/11. For complete rules, please go to the photo contest page. I can’t wait to see all of the submissions! This entry was posted on Monday, March 21st, 2011 at 3:47 pm and is filed under Photography Weekend. You can follow any responses to this entry through the RSS 2.0 feed. Responses are currently closed, but you can trackback from your own site.